Mark your calendars! The annual Autumn Viennese Waltz Ball will be held this year on November 9, 2019 at the historic Hotel Whitcomb in San Francisco, CA. For more information, click here. Welcome to the SF Waltzing Society's website! The San Francisco Waltzing Society is a social club originated in the early 1950ʻs by a group of Viennese Waltz enthusiasts replicating the ongoing tradition of the elegant Viennese Waltz Balls of Vienna. The Autumn Viennese Waltz Ball annually recreates this formal event with men wearing white tie and tails, women in ball gowns, and dancing to a live 30 piece Symphonic Orchestra playing the music of Johann Strauss and other famous composers. What makes our event stand out as one of the finest Viennese Waltz Balls is the music, superbly arranged for strict tempo waltzing by one of the early members of the club. Our event also includes polkas, quadrilles, an Austrian folk dance and often a dance contest. Dinner is an option and different prices are offered to accommodate different budgets and to encourage all ages and levels of dancers. To add to your dancing enjoyment we have added a Ballroom Dance Band playing Foxtrot, Rumba, Swing, Cha Cha and Tango. The venue changes due to availability and floor space that can accommodate up to 100 dancing couples. San Francisco Ballrooms in the past have included The Palace Hotel, The Presidio Officers Club, The World Trade Club,The Marines Memorial Hotel, The Regency Center and the St. Francis Yacht Club. 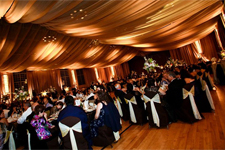 In Oakland Ballrooms include the Claremont Country Club and the Scottish Rite Center.